Just one question: why is this show only 30 minutes? This show is so awesome and it does everything right. Whether Mark learned some valuable lessons with Entourage, (because this is Entourage, the sports version), or he wanted to try something new and not pack everything into hour long episodes, he has a hit on his hands. 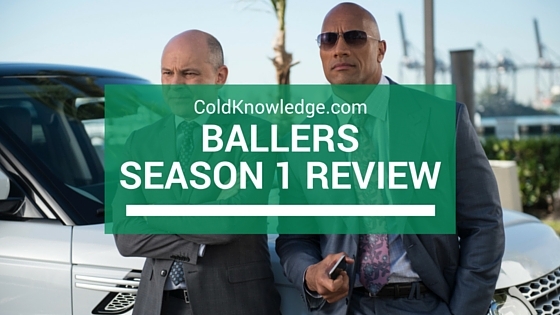 Dwayne Johnson & Rob Corddry are golden together on the screen, they just click. They both offer that comedic and serious role, not just one being the certain type. Everything that they did during the season was with a purpose. You got just enough camera time between the two, and you knew enough about Rob to stay interested. I see season two exploring more into his life and what he's about. The Rock was the man of the show though, he carried it with all of his demons and learning the ropes of being a brand new sports agent. By seasons end he definitely hit his stride and he became the man in Miami. The supporting cast was there and they all filled their roles in stride. There were two other story arch's going on during the show that didn't over shadow the main story line or let the main story line over shadow them. The cast made this show work from the get go. They story line highlighted everything wrong with being an athlete and touched on some right. I believe the story line will eventually evolve into something more that we aren't seeing, and I'm so ready for it. To my knowledge there weren't that many cameos in and that's a good thing about this show. It wasn't loaded with cameos to try and get people interested in the show. The show built it's merit based off the main cast and nothing else, which is going to be important down the line where they start bringing in more athletes to show their face and not have it all about them, but rather add to the shows overall value. The special effects were there, I mean not as in CGI or anything but in terms of players hitting each other, the two or three car crashes, and all of the fine women walking around dressed to impress. This show didn't need much of anything in the special effects department, but they did do a great job highlighting how beautiful Miami is. Not going to lie one second about wanting to go to Miami and partying after seeing how fun it was on the television show. Overall this first season was a great one in a sense that it was built off the characters and they carried it to success. This just further cements the fact that Dwayne can do no wrong in whatever role he has. And it also shows his depth as an actor, even though he knows what it's like first had to be a football player. He definitely bought his bigger than life persona to this role and I'm fully invested in this show for next season. It was the highlight of a crappy summer after having to watch True Detective, *sigh*. Any who, did you watch the show? If so, how did you like it? Leave it in the comments below.